Argentina's latitude and longitude is 34° 00' S and 64° 00' W . Below is the map of Argentina showing major towns, roads, airports with latitudes and longitudes plotted on it. The Argentine Republic is located on the geographic coordinates of 37.1833° S latitude and 67.3667° W longitude in South America. The latitude and longitude of Argentina is 34º 00' S and 64º 00' W respectively. It is located in the southern part of South America and lies between Chile and Uruguay. The total area is slightly smaller than three-tenths of USA. The capital, Buenos Aires lies between the geographical latitude of 34º 36'S and 58º 27' W longitude. There are 23 provinces and Argentina is 2 hours ahead of Washington DC during Standard Time. The climate of Argentina is mostly temperate in nature. However, the latitudinal and longitudinal positioning of Argentina gives it varied climatic conditions ranging from the sub-tropical to the sub-antarctic. The terrain has rich plains on the northern half, flat rolling plateau of Patagonia in the south and rugged Andes Mountains on the western border. 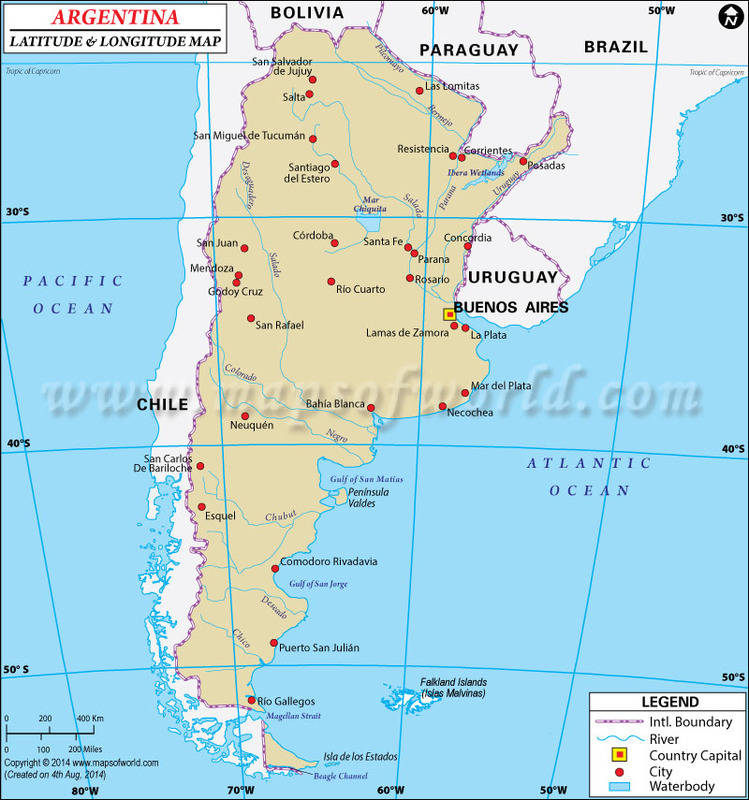 The total area of Argentina is 2,766,890 square kilometers with a coastline extending to 4,989 kilometers.